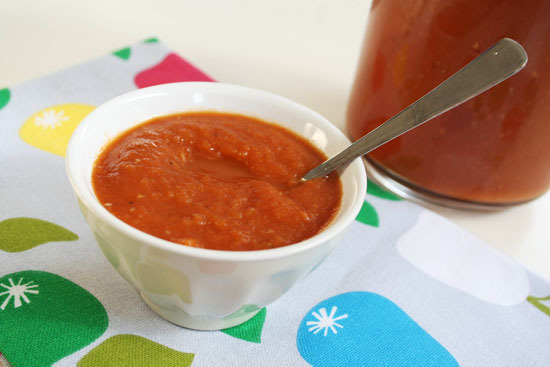 I love to use homemade sauces. You know exactly what’s inside them and you can add whatever you like. This tomato sauce is exactly how I like it. It’s a sweet sauce with a touch of sour, just perfect. If you would add some water it would also make a great tomato soup! Store it in the fridge for two weeks or freeze it for later uses. 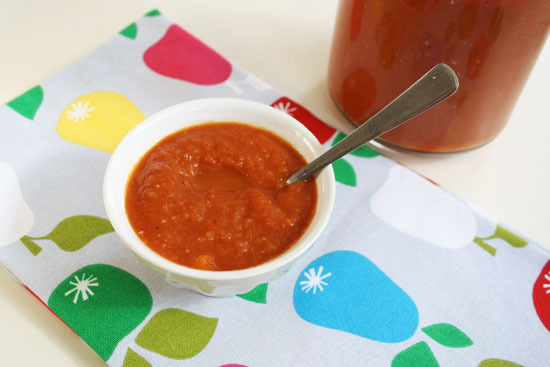 Learn how to make this delicious homemade tomato sauce after the jump. . . Put the onions in a pan and bake for 5 minutes. Add the garlic and bake for 30 seconds. Add the other ingredients and stir well. Cook for about 15 minutes. Put everything in a jar. Put your hand-held blender inside the jar and mix until your sauce is smooth. Let cool.